Slow … Cooker at Work - Family Times is an award-winning magazine with staff-written news, feature stories and artwork that inform and inspire Central New York parents and their children. As families look for ways to cut expenses, the food budget is often the first place to find savings. Going out to restaurants or eating fast food is neither cheap nor healthy. But cooking weeknight meals at home is often challenging for busy families. 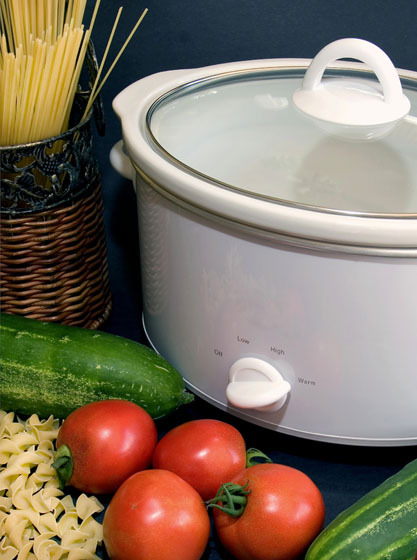 Look no further than a lowly appliance that 83 percent of American families already own: the slow cooker. Also known as a Crock Pot—the brand name of a kitchen appliance introduced by Rival Products in 1971—the slow cooker became an overnight success. “Cooks all day while the cook’s away!” Rival’s slogan proclaimed. If you don’t have one, slow cookers are reasonably priced at around $18 for the 2.5-quart capacity and are now made by several different manufacturers. Slow cookers cook by maintaining a constant temperature (usually between 170 and 280 degrees) for a length of time, from four to eight hours. The lower heat and longer duration helps less expensive, leaner cuts of meat become more tender and shrink less. Depending on the recipe, slow cookers operate on high for up to four hours or on low for up to eight hours. The U.S. Department of Agriculture says that the slow cooking process is safe because the direct heat from the pot, the length of cooking time and the steam created within the tightly covered container combine to destroy food-borne bacteria. If storing overnight for morning assembly, it is important to keep foods separated and refrigerated until they are ready to place in the cooker. The manufacturers also recommend that the pot be no less than half full and no more than three-quarters full. There should also be sufficient liquid to keep the food from drying out under constant heat. Whatever slow cookers promised when they were first introduced, the concept of slow cooking became associated with bland, tasteless meals that were little more than boiled and mushy versions of real food. Like any automated process, the result often depends on the input. The accompanying recipes incorporate spices, interesting ingredients, and an extra cooking stage to produce flavorful and rich main dishes, luxuriously waiting for you at the end of the workday. Only a little preparation is needed and most can be done the night before. There are differing opinions on whether using a slow cooker (which is the equivalent of powering a light bulb all day) is more or less efficient than using an oven (which cycles off and on to maintain temperature for a shorter period of time). But if you cook an entire meal in a slow cooker, then you will not have to use additional energy like you would with the oven plus stovetop and microwave. The real savings is in your energy—slow cooking simply takes less labor! Eliminate the 5 o’clock panic of “what am I going to cook for dinner?” Employ a slow cooker, spend less time in the kitchen, and sit down to satisfying meals that the whole family will appreciate. The house fills with delicious aromas, won’t heat up as with conventional cooking, and makes enough for leftovers. Relax and make it slow! 1. Combine all ingredients except chips, cheese and toppings in large slow cooker. 2. Cover. Cook on low heat for 8 hours. 3. Just before serving, remove chicken breasts and slice into bite-sized pieces. Stir into soup. 4. To serve, put a handful of chips into individual soup bowls. Ladle soup over chips. Top with cheese and garnish with optional toppings. Makes 6 to 8 servings. 1. Place roast in slow cooker. 2. Combine cranberry sauce, sugar, cranberry juice, mustard and cloves. Pour over roast. 3. Cover. Cook on low heat for 6 to 8 hours, or until meat is tender. 4. Remove roast and keep warm. 5. Skim fat from juices. Measure 2 cups, adding water if necessary. Pour into saucepan. Bring to boil over medium heat. Combine the cornstarch and cold water to make a paste. Stir into gravy. Cook and stir until thickened. Season with salt and fresh ground pepper. 6. Serve with sliced pork. Makes 4 to 6 servings. 1. Rub salt and pepper into the skin of the chicken, then place apple and celery inside the chicken. 2. Put potatoes into the bottom of the slow cooker. 3. Place chicken on top of potatoes and sprinkle chopped onion, rosemary, and lemon juice and zest over chicken. 4. Pour 1 cup hot water into slow cooker. 5. Cover and cook on high heat for 1 hour. Switch to low heat and cook for 6 to 8 hours. Makes 6 servings. 1. Heat 2 tablespoons of oil in large skillet over medium heat. Add the eggplant and onion and cook, stirring until softened, about 5 minutes. Using a slotted spoon, transfer the eggplant and onion mixture to slow cooker. 2. Add the bell pepper, garlic, zucchini, tomatoes and their juice, and thyme. Season with salt and pepper. 3. Cover and cook on low heat for 4 hours, until vegetables are tender. 4. Just before serving, stir in pesto. Makes 4 to 6 servings. 1. Preheat the broiler. Place the tomatillos, chilies, onion and garlic on a baking sheet. Broil, turning occasionally, for 5 to 7 minutes, until blackened. Remove from boiler and transfer to cutting board. When cool enough to handle, chop the vegetables. 2. Transfer the vegetables to a blender and add the tortillas, stock and fennel. Puree until almost smooth. Add more stock as needed to achieve the thickness you prefer. 3. Heat a large sauté pan over medium-high heat and add the oil. In batches, if necessary, add the pork and cook, turning, for 8 to 10 minutes, until browned on all sides. Using tongs, transfer to the slow cooker. 4. Pour the sauce over the pork. Cover and cook on low heat for 6 to 8 hours, until the meat is very tender. Stir in the cilantro and salt to taste, about 10 minutes before serving. 5. Transfer to serving dish and sprinkle the cheese over the top. Serve immediately. Makes 4 to 6 servings. 1. Place the mushrooms in a bowl and cover with warm water. Soak for 30 minutes, or until plumped. Drain and rinse thoroughly to remove any sand or dirt. 2. Combine the ¾ cup flour and salt in a resealable plastic bag. Add the chicken pieces to the bag, several pieces at a time, and shake to coat completely. 3. Heat a large sauté pan over medium-high heat and add the oil. Add the chicken and cook, turning, for 7 to 10 minutes, until browned on both sides. Using tongs, transfer to paper towels to drain. 4. Set the sauté pan over medium-high heat and add the onion and the 2 tablespoons flour. Sauté, stirring frequently, for 10 minutes, or until lightly browned. Gradually add the wine, stirring to scrape up the browned bits from the bottom of the pan. Add the stock and cook, stirring constantly, for 15 minutes, or until the sauce is thick enough to coat the back of a spoon. Add the mushrooms and stir well. 5. Layer the chicken and artichokes in the slow cooker. Pour the mushroom mixture and any pan juices over the chicken and artichokes. 6. Cover and cook on low heat for 4 to 6 hours, until the chicken is tender. Arrange the chicken, artichokes and mushrooms on a platter. 7. To the juices remaining in the slow cooker, add the lemon juice and egg yolks, and whisk until smooth and thickened. Pour the sauce over the chicken and vegetables on the platter and garnish with the parsley and oregano. Makes 4 to 6 servings. 1. Heat 1 tablespoon of the oil in a skillet over medium heat. Add the onion and carrot, cover and cook until softened, about 5 minutes. 2. Transfer the onion and carrot to a lightly oiled slow cooker and add the bell pepper, garlic, corn, pinto beans and chilies. Stir in the stock, soy sauce and cilantro, and season with salt and pepper. 3. Cover and cook on low heat for 5 hours. 4. About 1 hour before you’re ready to serve, make the topping: In a large bowl, combine the cornmeal, baking powder, baking soda and ½ teaspoon salt. Add the milk and the remaining 2 tablespoons oil and stir to blend. 5. Drop the cornmeal batter onto the vegetables by the spoonful and spread it over the top. 6. Turn the heat setting to high, cover and cook until the topping is cooked through, about 1 hour longer. For best taste results, serve the potpie within 10 to 15 minutes after the crust is finished cooking. Makes 4 servings. 1. Heat the oil in a large skillet over medium heat. Add the carrots and onion, cover and cook until softened, about 5 minutes. 2. Add the garlic, curry powder, coriander and cayenne, stirring to coat. 3. Transfer the vegetable mixture to slow cooker. Add the potatoes, green beans, chickpeas, tomatoes and stock. 4. Cover and cook on low heat for 6 to 8 hours. 5. Just before serving, stir in the green peas and coconut milk and season with salt. Taste to adjust seasonings. Serve over hot, cooked long-grain rice. Makes 4 servings. 1. Heat the oil in a small skillet over medium heat. Add the onion, cover and cook until softened, about 5 minutes. 2. Transfer the sautéed onions to slow cooker. Stir in the wild rice, garlic and stock. Season with salt and pepper. 3. Cover and cook on low heat for 5 to 6 hours. 4. About 15 minutes before serving, stir in the brown rice, peas, lemon juice and zest, and tarragon. Taste to adjust seasonings and serve. Makes 4 servings. 1. In a slow cooker, stir together the cod, tomatoes, clam juice (or stock), onion, celery, carrots, wine, parsley, rosemary, and salt and pepper. 2. Cover, and cook on low heat for 7 to 8 hours, or on high heat for 3 to 4 hours. 3. One hour prior to serving, mix flour, butter and light cream in a small bowl. 4. Stir into the slow cooker until the fish mixture is thickened. Makes 4 servings. 1. Place sliced potatoes in slow cooker. 2. In a medium bowl, mix together shredded cheese, onion and ham. 3. Mix with potatoes in slow cooker. 4. Using same bowl, stir together condensed soup, water and garlic powder. 5. Pour evenly over the potato mixture. 6. Cover and cook on high heat for 4 hours. Makes 8 servings.